Kirklareli University Journal of the Faculty of Economics and Administrative Sciences (KLUJFEAS) is international scientific refereed journal which is indexed by Asos Index, DRJI, CiteFactor, Google Scholar, Index Copernicus, Academic Keys, ResearchBib, Arastirmax, Sobiad, Sindex, Eurasian Scientific Journal Index, i-Focus and International Scientific Indexing and welcoming papers for publications as original research papers, research notes, technical notes, book reviews and scientific letters to editors. The journal is published twice per year in March and September. Manuscripts submitted to the journal are only accepted if they have not been or will not be published and should not be under review elsewhere. Manuscript’s language is Turkish and English. All responsibility of the studies belongs to the author(s). Studies should be prepared in accordance with international scientific ethics rules. Studies must be sent via Dergipark website (http://dergipark.gov.tr/klujfeas). For the studies accepted for publication in our journal, signed Copyright Transfer Form must be sent to the journal editorial. Papers are firstly checked for their eligibility for technical and journal’s style. The manuscripts that do not suit journal’s standards or not suitably correspond to the scope journal are refused with unexplained reason. Manuscripts that are found suitable for peer review will be assigned to two expert reviewers (blind review). The final decision to accept or reject a manuscript will be made by the Editorial Boards. After the review process, the Editorial Boards will inform the authors of acceptance, rejection or necessity of revision of the manuscript. ﻿Kırklareli University Journal of Economics and Administrative Sciences is pleased to announce that it welcomes articles on various disciplines of social sciences such as International Relations, Political Science, Public Administration, Economics, Business Administration, Finance, Econometrics, Labor Economics and Industrial Relations for its September 2019 issue. There is no limit on topics. We are inviting all academics and researchers to contribute to the next issue of our journal with their original papers. 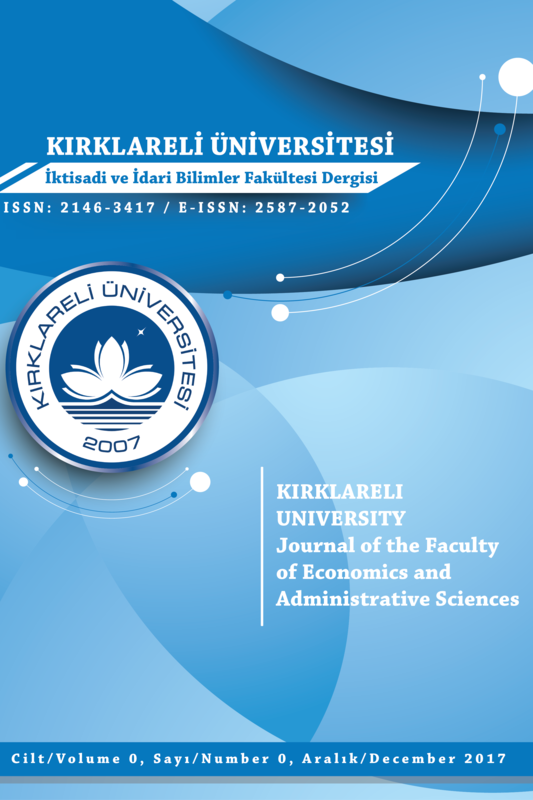 Kırklareli University Journal of Economics and Administrative Sciences is an internationally peer-reviewed, interdisciplinary and internationally indexed journal, published biannually. Articles can be either in Turkish or English. Abstracts should not exceed 100 words.